Prostate cancer (PCa) is an important cause of morbidity and mortality worldwide. It is the fifth most common cancer globally and second most common in men. In Nigeria, PCa is the most common cancer among males, accounting for 6.1%–19.5% of all cancers and the incidence is increasing. A peculiar finding in our setting is that most patients present with a high-grade tumor, resulting in high morbidity and mortality. In the United States of America, the National Cancer Institute Surveillance Epidemiology and End Results review estimated about 241,740 new cases of PCa to be diagnosed in 2012. The estimated PCa attributable mortality for the same year was 28,170. Determination of serum prostate-specific antigen (PSA) concentration and estimation of the degree of tumor differentiation (using Gleason grading system) are two important parameters that have found relevance over time in patients with PCa. The most acceptable grading system for PCa is the one proposed by DF Gleason in 1966. This system is based on tumor architectural patterns and is arrived at by assigning two grades to the two most common architectural patterns and reported as the Gleason score (GS). However, the management of PCa has changed since the original system was proposed and pathologists felt a need for a modification of the original Gleason system to reflect modern practice. This resulted in changes in the Gleason grading system by the International Society of Urological Pathology (ISUP) consensus conferences in 2005 and 2014. 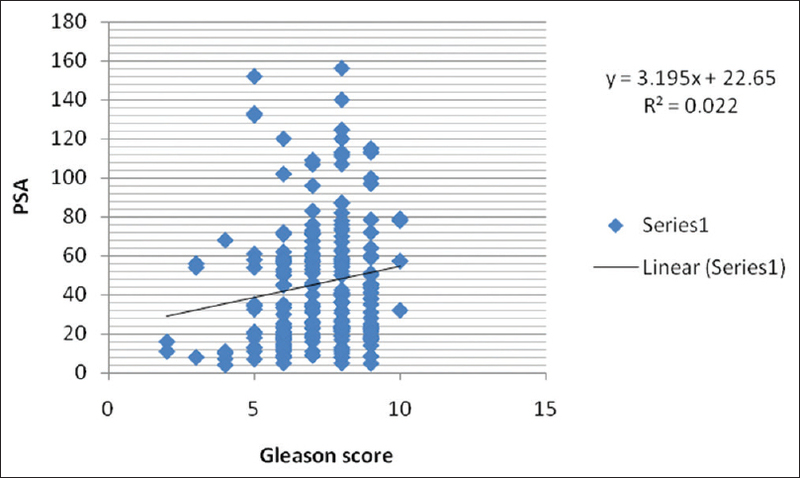 The new Gleason grade group system, which is a modification of the original Gleason scoring system, was first described in a 2013 paper in BJU International. In 2014, the ISUP consensus conference endorsed the grade group system and proposed its adoption in a 2016 report published in the American Journal of Surgical Pathology. Furthermore, the World Health Organization accepted it for inclusion in the 2016 edition of Pathology and Genetics: Tumours of the Urinary System and Male Genital Organs. The system consists of five-grade groups that correspond to traditional GSs 6, 3 + 4, 4 + 3, 8, 9, and 10, with grade group 1 indicating the most favorable prognosis and grade group 5 the least favorable. The argument in favor of the 2016 modification is that it offers a more accurate prognostic categorization of patients with adenocarcinoma, therefore providing a more solid basis for clinical decision making in such patients. The aim of this study therefore is to investigate the correlation of serum PSA concentration (which is an established prognostic criterion) with the 2016 modification of the Gleason grading system (Gleason grade group system) among patients with adenocarcinoma of the prostate in Ahmadu Bello University Teaching Hospital (ABUTH), Zaria, Nigeria. After obtaining clearance from the Ethical Committee, this retrospective study was conducted based on the analysis of hematoxylin and eosin-stained histological slides prepared from paraffin-embedded tissue specimen of prostate biopsies from January 2006 to December 2013 and the histology request cards were filled by the attending clinician. These were obtained from archives of the Pathology Department of the ABUTH, Shika, Zaria, Nigeria. Further, the clinical notes of the study patients were retrieved from the Urology Unit of the hospital from where values of the serum PSA concentration of the patients were extracted. The tumors were then graded using the new (2016) Gleason grade group system. Cases in which core biopsies were followed by prostatectomy were assessed by the prostatectomy specimens to avoid duplication of cases. The Sextant Protocol was strictly followed in specimens gotten via trucut biopsies to ensure the grading is reflective of the tumor. In the case of broken or missing slides, fresh sections were made from stored tissue blocks. Patients' clinical information including prebiopsy recorded serum PSA concentrations was retrieved from either the histology request cards filled by the attending clinician or the patient's clinical notes. Analysis of the collected data was carried out using Microsoft Office Excel 2010 and Statistical Program for Social Sciences Version 20. Frequencies of variables were determined and cross-tabulated. Continuous variables were summarized using means and standard deviations. Analysis of variance (ANOVA) was employed to compare means and determine statistical significance. Pearson's correlation coefficient was also employed to test the relationships between serum PSA and ungrouped GS. The level of statistical significance was set at P ≤ 0.05. Results were presented using figures and tables, and the findings were compared with similar studies done locally and internationally. The patients' ages ranged from 35 to 100 years, with a mean of 66.3 ± 10.54 years [Table 1]. The age range of 60–69 years (36.5%) was the largest among the patients in this series. Two (0.8%) of the patients were below the age of 40 years. The mean serum PSA concentration was 45.48 ± 32.39 ng/mL (range 4.0–156.20 ng/mL) [Table 2]. None of the patients in our series had serum PSA concentration <4.0 ng/ml and only 16 (7.6%) had values <10 ng/mL. Eighteen patients (8.5%) had serum PSA values ≥100 ng/mL. Gleason grade group 1 was most common in our study with 68 (32.2%) of our patients falling within that category [Table 3] while grade groups 2, 3, 4, and 5 had 13 (6.2%), 29 (14%), 63 (29.9%), and 38 (18%) patients, respectively. The mean serum PSA concentration for patients falling within grade groups 1, 2, 3, 4, and 5 was 36.62, 44.7, 49.24, 54.84, and 59.05, respectively [Table 4]. ANOVA revealed a statistically significant relationship between the serum PSA concentration and the Gleason grade group of cancer (P = 0.00) [Table 5]. Equally, a statistically significant relationship was also found between the serum PSA concentration and the ungrouped GS of our patients (Pearson's correlation coefficient = 0.149, P = 0.031) [Figure 1]. The patients' age range of 35–100 years found in our study is higher than reported by Oluwole et al. (30–79 years) in a previous study from this center but in accordance with studies from Benin, Port Harcourt, and Côte d'Ivoire. The mean age of the patients in this series was 66.3 years and the age group of 60–69 years was the most common among our patients. A similar figure was found by Ahmed et al. in a previous study from this center and by Okolo et al. and Odubanjo et al. from other centers in Nigeria. However, PCa occurred a decade earlier in our patients as compared to their White counterparts in Europe and America where it mainly presents in the eighth decade. This probably reflects the profound effect genetic and environmental factors have on the natural history of PCa. Three (0.8%) of the patients are below the age of 40 years. Similar reports were made by Ekwere and Egbe. in Southeastern Nigeria and by Sakr et al. among American young men within the age group of 30–40 years. This may require further research for additional genetic, dietary, or environmental factors. The mean serum PSA concentration was 45.48 ± 32.39 ng/mL (range 4.0–156.20 ng/mL). These are comparable to the values previously reported by Ahmed et al. from our center and Odubanjo et al. from Lagos but lower than the values reported by Okolo et al. and Abbiyesuku et al. among men with PCa from other parts of Nigeria. Significantly lower mean serum PSA concentration was reported by Rasool et al. among Pakistani men with PCa and by Moul et al. among White men with PCa in the US. The variations among different ethnic groups may be attributable to genetic factors while the variations among Blacks may be due to the fact that several other coexisting conditions other than PCa may lead to elevation of serum PSA. These include benign prostatic hyperplasia, prostatitis, urinary tract infection, and instrumentation. 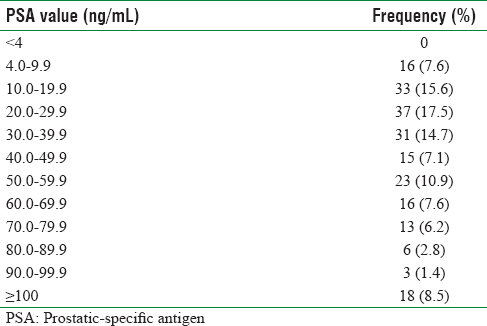 None of the patients in this series had serum PSA concentration <4.0 ng/mL. Some previous studies by Ekwere and Egbe and Odubanjo et al. also documented very small figures (2% and 3% respectively) and may be explained by the fact that most doctors only recommend prostate biopsy in patients with a serum PSA concentration of ≥4.0 ng/mL. The mean (ungrouped) GS among the patients studied was 7.15 ± 1.51. GSs 8 and 7 were most common among the patients. This is in accordance with previous studies from Zaria and with the works of Okolo et al., Ekwere and Egbe and Odubanjo et al. from other centers in Nigeria. Gleason grade group 1 was the most common in our study with 68 (32.2%) of our patients falling within that category while grade groups 2, 3, 4, and 5 had 13 (6.2%), 29 (14%), 63 (29.9%), and 38 (18%) patients, respectively. This contrasted sharply with studies in many centres in Nigeria,, and with studies among Black population in the US. However, this may be explained by the fact that the other studies were all not based on the new (2016) Gleason grade group used in this study. The grade group system lumped up all hitherto GSs of 2–6 into grade group 1, therefore expanding the population of the group. Our study revealed a statistically positive correlation between the serum PSA value and the Gleason grade group of cancer. This is in keeping with previous works by Epstein et al. and Spratt et al. The above-cited works also demonstrated that serum PSA has a stronger correlation with the Gleason grade group than it does with the corresponding ungrouped GSs of cancer. This study concluded that in patients with prostatic adenocarcinoma, there is a statistically significant association between serum PSA levels and newly introduced (2016) Gleason grade group of prostatic carcinoma. It recommends for additional studies to be conducted to further investigate the clinical utility of the new grade group system in prospective clinical trials. Such studies should also examine the relationship between the new Gleason grade group and stage of cancer. This will further enhance prognostication and estimation of the risk of disease progression. Ferley J, Shin HR, Forman D, Mathers C, Parkin DM. Estimate of worldwide burden of cancer in 2008: GLOBACAN 2008. Int J Cancer 2010;127:2893-7. Jedy-Agba EE, Curado MP, Oga E, Samaila MO, Ezeome ER, Obiorah C, et al. The role of hospital-based cancer registries in low and middle income countries-the Nigerian case study. Cancer Epidemiol 2012;36:430-5. Dawam D, Rafindadi AH, Kalayi GD. Benign prostatic hyperplasia and prostate carcinoma in native Africans. BJU Int 2000;85:1074-7. Sylla BS, Wild CP. A million Africans a year dying from cancer by 2030: What can cancer research and control offer to the continent? Int J Cancer 2012;130:245-50. Partin AW, Oesterling JE. The clinical usefulness of serum prostate specific antigen: Update 1994. J Urol 1996;155:294. Fang YQ, Zhou XF, Qiu JG, Wen XQ, Wang DJ, Pang J, et al. Serum PSA level and Gleason scores of needle biopsy specimens predict the postoperative pathologic grade of prostate cancer. Acta Med 2013;29:279. Humphrey PA. Adenocarcinoma: Grading of prostatic carcinoma. In: Prostate Pathology. Chicago: ASCP Press; 2003. p. 259. Montironi R, Santoni M, Mazzucchelli R, Burattini L, Berardi R, Galosi AB, et al. Prostate cancer: From Gleason scoring to prognostic grade grouping. Expert Rev Anticancer Ther 2016;16:433-40. Magi-Galluzzi C, Montironi R, Epstein JI. Contemporary Gleason grading and novel grade groups in clinical practice. Curr Opin Urol 2016;26:488-92. Pierorazio PM, Walsh PC, Partin AW, Epstein JI. Prognostic Gleason grade grouping: Data based on the modified Gleason scoring system. BJU Int 2013;111:753-60. Epstein JI, Egevad L, Amin MB, Delahunt B, Srigley JR, Humphrey PA, et al. The 2014 international society of urological pathology (ISUP) consensus conference on Gleason grading of prostatic carcinoma: Definition of grading patterns and proposal for a new grading system. Am J Surg Pathol 2016;40:244-52. Oluwole OP, Rafindadi AH, Shehu MS, Samaila MO. A ten-year study of prostate cancer specimens at Ahmadu Bello University Teaching Hospital (A.B.U.T.H), Zaria, Nigeria. Afr J Urol 2015;21:15-8. Akang EE, Aligbe JU, Olisa EG. Prostatic tumours in Benin city, Nigeria. West Afr J Med 1996;15:56-60. Obiorah CC, Nwosu SO. A histopathological study of carcinoma of the prostate in port Harcourt, Nigeria. Niger J Clin Pract 2011;14:363-7. Ahmed M, Maitama HY, Bello A, Kalayi GD, Mbibu HN. Transrectal ultrasound findings in patients with advanced prostate cancer. Ann Niger Med 2010;4:59-61. Odubanjo MO, Banjo AA, Ayoola S, Abdulkareem FB, Anunobi CC, Olayinka AA. The clinicopathologic pattern of prostatic carcinoma in Lagos, Nigeria. N A J Med Sci 2013;6:71-5. Boring CC, Squires TS, Heath CW Jr. Cancer statistics for African-Americans. Cancer J Clin 1992;4:7-17. Ekman P. Genetic and environmental factors in prostate cancer genesis: Identifying high-risk cohorts. Eur Urol 1999;35:362-9. Ekwere PD, Egbe SN. The changing pattern of prostate cancer in Nigerians: Current status in the South Eastern states. J Natl Med Assoc 2002;94:619-27. Sakr WA, Haas GP, Cassin BF, Pontes JE, Crissman JD. The frequency of carcinoma and intraepithelial neoplasia of the prostate in young male patients. J Urol 1993;150:379-85. Rasool M, Iqbal SA, Pansota MS, Tabassum SA, Ahmad I. Prostatic carcinoma: Association between serum prostatic specific antigen (PSA) and Gleason grade. Prof Med J 2015;22:710-4. Moul JW, Connelly RR, Mooneyhan RM, Zhang W, Sesterhenn IA, Mostofi FK, et al. Racial differences in tumor volume and prostate specific antigen among radical prostatectomy patients. J Urol 1999;162:394-7. Freeman VL, Leszczak J, Cooper RS. Race and the histologic grade of prostate cancer. Prostate 1997;30:79-84. Epstein JI, Zelefsky MJ, Sjoberg DD, Nelson JB, Egevad L, Magi-Galluzzi C, et al. Acontemporary prostate cancer grading system: A validated alternative to the Gleason score. Eur Urol 2016;69:428-35. Spratt DE, Cole AI, Palapattu GS, Weizer AZ, Jackson WC, Montgomery JS, et al. Independent surgical validation of the new prostate cancer grade-grouping system. BJU Int 2016;118:763-9.